Defendants in high-profile theater embezzlement case to go on trial | Russian Legal Information Agency (RAPSI). 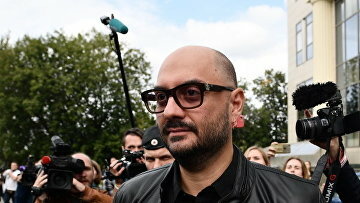 MOSCOW, October 2 (RAPSI) – A high-profile embezzlement case involving the Gogol Center theater director Kirill Serebrennikov has been forwarded to Moscow’s Meshchansky District Court for hearing, the press service of Russia’s Prosecutor General’s Office reports. Prosecutors have approved indictment in the case, the statement reads. Investigators believe that he was an organizer of the budget money embezzlement. He allegedly created Seventh Studio stage company to actualize the Platforma project for promotion of art and called alleged accomplices into the organization. He pleaded not guilty. Other defendants in the case are ex-head of Seventh Studio stage company Yury Itin, ex-general producer Alexey Malobrodsky, and former Seventh Studio chief accountant Nina Maslyayeva, ex-official of Russia’s Culture Ministry and current director of the Russian Academic Youth Theater Sophia Apfelbaum. Producer Yekaterina Voronova, has been put on the international wanted list and arrested in absentia as part of the case. Maslyayeva has testified against Serebrennikov. She said that Serebrennikov, Malobrodsky and Itin organized embezzlement of money allocated for a cultural event. Serebrennikov and Malobrodsky cashed the money with the assistance of Maslyayeva. The woman also said that she entered falsified data in financial reports.